We bring John Marshall’s legacy to life through a variety of distinctive educational programs including Justice in the Classroom grade 6-12 civics education, annual teacher awards, continuing legal education, Marshall-related lectures, and our most recent endeavor, The King of Crimes, a play and feature film about Aaron Burr’s treason trial in John Marshall’s court. The Foundation is committed to finding new and innovative ways to tell Marshall’s story and that of our nation’s constitutional founding. Nominations and applications are now being accepted for the 2019 John Marshall Foundation Teacher Awards. Click here for more information and nomination forms. Thank you! Justice in the Classroom – our signature civics education program is in its third year of expansion into new regions of the Commonwealth thanks to generous funding from the Virginia Law Foundation whose mission is to promote through philanthropy the rule of law, access to justice, and law-related education. A pilot lawyer and judge program, developed in partnership with the John Marshall Inn of Court, launched in Fall 2018 matching teachers who would like a judge or attorney to visit their classroom with judge and attorney volunteers, bringing real-world connections to the study of the judiciary and the Constitution. The King of Crimes: the Aaron Burr treason trial in John Marshall’s court is a new a play by David L. Robbins. Thanks to generous donors, 1,200 Richmond Public Schools students attended performances free of charge and five public performances sold out in early 2018. Our thanks to the E. Rhodes and Leona B. Carpenter Foundation, the Herndon Foundation, Virginia H. Spratley Charitable Fund II, Caroline Smith Parkinson, J. Kenneth Timmons Irrevocable Trust, the late Hon. Watson “Bubba” Marshall and his wife, Cynthia A. Marshall, and South State Bank for making the premiere possible. For information about presenting the play, email us at jonialbrecht@johnmarshallfoundation.org or contact the John Marshall Foundation at 804.775.0861. 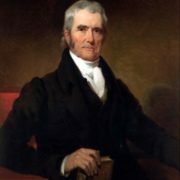 John Marshall: Patriot, Statesman, Chief Justice – an exhibit at the National Constitution Center in Philadelphia, 2017. Establish a national academic center focused on the study of Marshall’s influence on the American judiciary and the role of the federal courts in the lives of Americans. The center will produce new scholarship for academic and public audiences aimed at expanding the public’s knowledge of the rule of law under the Constitution. Evaluate, staff, and expand the reach of the Justice in the Classroom grade 6-12 civics program. JMF will contract with a school of education to conduct the evaluation and consult in the hiring of a full-time director of education. Secure permanent administrative and programming space for the co-location of the Foundation and its partners in the vicinity of Preservation Virginia’s John Marshall House in stride with the neighborhood’s overall redevelopment.